I’ve been working in a class that is titled “Level 1 ESL,” for a few weeks. I haven’t done introductory level teaching in a while, and it’s resulted in me codifying things that are much more conversational and spontaneous in types of classes that I teach on a regular basis. It’s also changed the way that I use confusion as a catalyst for language engagement, since confusion seems to be more present in the molecules of the space. Over time, I am definitely describing myself more and more as a dogme teacher. I realize that dogme does not mean ‘unplanned’ or ‘not-codified,’ yet I think that as things become more and more codified, and the codes are followed more strictly–without room for spontaneous decision or switching gears based on ‘conversational’ experience and rhythm–things tend to get less dogme. While reading the description above gave me a good feeling like “yeah. that’s what I do! That’s what I want to do forever,” I also realize that I am changing my style in the Level 1 class I’m teaching. And I guess I’m wondering if its something that’s necessary because of where the learners are, or just because I feel safer if things are more planned out and I follow the plans, because Level 1 classes are not the spaces I live in regularly. Interesting thoughts, David – and you’re not alone in thinking that low-level classes require a greater degree of planning and structuring. Need this be based around a grammmar syllabus, though? Couldn’t low level teaching prioritise lexis, instead – on the grounds that – without a critical mass of words and phrases – all the grammar in the world is not going to trigger communicative effectiveness? Yeah. I remember having a conversation in the past about Lexicalism and sending you a few papers written on this approach to teaching language. Thinking about it now, I can see how a lexicalist approach could be used to catalyze language use in a more dynamic way. This also makes sense in my current context: people in the class have been asking me for more vocabulary. It’s been easy to use a Language Experience Approach in class, but this has been kind of limiting the kinds of lexemes I can introduce. But it’s really nice to have a challenge coming from a dogme direction. I agree with the description of the curriculum as a mission statement, but it can also be an expanded description of teaching/learning objectives, the scope, if not the sequence, of what needs to be taught. The last category in particular leads us into areas which we may not always be aware of at the chalkface/in the classroom, but which underline the strategic significance of the work which goes on there. At the same time, it can be a useful reminder that the point of learning a language is not simply a matter of manipulating a point of grammar or memorizing lexis, but something more holistic, and which contributes to the idea of quality education. Secondly, on a practical, day-to-day basis, I prefer to use the term ‘syllabus’ to describe the various taxonomies of skills, the extent of grammar points, the list of words, the categories of culture, and all the other discrete areas of learning which the curriculum aspires to include. So the curriculum is made up a of a series of syllabuses. I’m not sure if the term ‘a multi-syllabus course design’ originated with the Cambridge English Course in the 1980s, but it was certainly the first time that it appeared to make sense in practical terms, at least as far as the coursebook was concerned. To a large extent, the multi-syllabus course design remains for me at the heart of communicative teaching with textbooks even today, although the inclusion of these ‘ultra’ classroom objectives has lead me elsewhere to characterize this as communicative +1. It’s certainly a little beyond the remit of langauge teachers when I began writing textbooks in the 1980s, but better reflects the aspirations of language curriculum reform in many countries in the 21st century. Thanks Simon, for those insights (culled from enormous experience in the field) as to the relationship between curriculum and syllabus. I differ only in some details of wording. For example, wouldn’t it be more accurate to say – not that “the curriculum is made up a of a series of syllabuses” – but that it can be realised (or enacted, or whatever) through a series of syllabuses? I.e. that a curriculum can engender any number of different syllabuses, each one enshrining the broad curricular goals, but customised for particular local needs. But the curriculum itself is more than the sum of the syllabuses it generates? And I remember the Swan and Walter Cambridge course being labelled as a ‘multi-layered syllabus’, rather than as a ‘multi-syllabus course’, but I may be wrong, and perhaps it doesn’t matter anyway. The point is, that it was innovative in the sense that it attempted to specify the learning objectives more comprehensively than the kind of narrowly focused, single-strand syllabuses that had, up until then, been the norm. In that sense, the multi-layered syllabus was a predecessor of the intricately detailed taxonomies we now associate with the Common European Framework. Yes, I’d agree with your rewording, and am grateful for its greater precision. Maybe my memory lets me down, in which case I’ve been assigning wrongly an acknowledgement to the Cambridge English Course for the concept of a multi-syllabus course. Perhaps I can now, twenty years later, claim it for myself! Run past that ‘born out’ again ! It’s an example of how English changes . I mean , just how weird is the analysis of the apparently straightforward , ” Where were you born ? ” , which turns out to use a now obscure verb plus a spelling change in the passive voice . By the by — thinking about how English has changed — does anyone use ‘As thin as a wraith’ these days , or must we say ‘As thin as a rake ‘ ? The first seems self-consciously obscurantist , the second doesn’t make any sense . Interesting quote there – but even public schools, espousing (for example) the “New Zealand Curriculum” and under centralised controls may have mission statements which inherently contradict that curriculum. Schools are after all specific cultural and historical sites with “their own logics of practice” (Lingard, Hayes Martin and Christie 2003). By way of example I would offer that all schools in New Zealand have to be a part of the bicultural framework of the Treaty of Waitangi, yet there are schools that offer many second language subjects but not Maori. If curriculum is the conversation that learners and institution (domain) have, then it will probably be best articulated in the school’s mission statement – which will (should) indicate the culture of the school, as bound in the history of the school – “our way of doing things”. That conversation will be bound by the rules the institution has developed for “how they do things” and feed upwards as well as downwards (this will undoubtedly reflect the ‘culture’ of the country the school lies in as well – and may be open to criticism depending on political flavours of the time). If the conversation learners and teachers have differs from the mission statement I think teachers in particular will find out very quickly. Teachers that fundamentally disagree with the curriculum (which I take to mean ‘our way of doing things’) even if they don’t realise it (ie their practice just doesn’t fit with the school’s objectives) will probably not last long in that place, but will inevitably find a place where what they do corresponds with the way the school wants to do it (or live incredibly unhappy professional lives). This is not to say that the culture of any school can not change, but that to do so would take a mighty effort because practice becomes ingrained in the systems, processes and thinking behind what the school means to its public. Thanks for that comment, Darridge. It made me wonder if some of those teachers who ‘fundamentally disagree’ with the existing curriculum don’t also have the potential to become the innovators – even the visionaries – who effect radical educational reform. 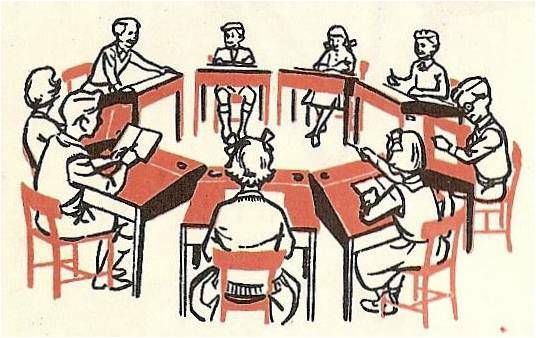 In the NZ context, Sylvia Ashton-Warner, who refused to toe the Board of Education’s line, pioneered an approach to teaching literacy that had a lasting impact – although admittedly she was fairly marginalised in her lifetime. That is to say, if you don’t agree with the curriculum, you can ship out, or you can stay and struggle to change it from within. Haha, Alex. I couldn’t find a picture that illustrated ‘curriculum’, so in the end I was reduced to a smiley face! A little further off topic, but he really looks like Derek Jacobi in ‘I Claudius’ in that picture. – the content selected at the beginning cannot be seen as definitive. – the most valuable learner data is usually obtained in an informal way after relationships have been established between teachers and learners. – What is regarded as a criterion of success? Thanks for the informative and thought-provoking post Scott! I’ll certainly take up the exercise you proposed and take a look at the references. “What is regarded as a criterion of success?” Great question, Willy, and one worth debating with your colleagues. It depends, of course, who you ask. For many school owners, it’s ‘bums on seats’. For a lot of learners (bit not all) it may be achieving a high score in an exam like IELTS. For some (many?) teachers it may simply be the satisfaction of witnessing their learners become more confident and fluent. For others, success is the day a student remembers the third person ‘s’! What’s interesting is that these criteria are seldomly openly debated in institutions, yet they are crucial, because unless there is a consensus, all the other curricular decisions (such as syllabus design and selection of texts) are unlikely to achieve signifcant change. In my experience, it’s when teachers start deciding on the design and content of end-of-course tests that these issues really emerge – and you can get quite heated arguments in staffrooms about the competing goals of accuracy and fluency, for instance. It seems, from the nature of the responses that the term ‘curriculum’ leads to a much deeper, philosophical discussion on overall learning objectives to be achieved from a course of study. Syllabus is much more concrete with discussion more on inclusion of specific discrete language items, tasks-types, exams, etc. I agree that a discussion of “What is the curriculum?” is a worthwhile endeavour within an institution as it sets the framework for learning. The syllabus is one aspect of this but curriculum is so so much more. If that is the case, Nunan’s curriculum as totality view is the right way to start when discussing the difference between a curriculum and a syllabus. Beliefs, values and theory aside, I think there may be a BrE and AmE difference relating to scale with the word ‘curriculum’. In my (limited) experience, in the US the term ‘curriculum design’ is often used in contexts in which we would say ‘course design’ in the UK. Am I right in thinking we’d tend to associate it with large scale projects in BrE? It seems to be applied to quite small projects as well here in the the US. I wish this had been earlier in the year, I’d of sent my students here! We have a thread a million miles long on this topic but alas, you know how higher education (and publishers) are, ownership, need a key, and all that jazz. But I’ve had a chance over the last few years of using Graves and Nunan as texts (also Richards), to think about this. Your statement is about as true as it gets. That’s what it boils down to. Who do you think shot the sheriff and how are you going to teach it? And I’ll second your notion that our ideas about curriculum are seldom debated in schools/institutes. It’s as if we just let the bad guy shoot away, without asking who shot him. We really need these debates or our schools become stale places of NO belief and importance. They stand for nothing and the curriculum is a man, head full of straw. That’s my 5 cents worth. But I ALWAYS remind teachers that the curriculum (small c) is the English language and also all those other things that creep in to make classes beautiful and messy – like feelings, ideologies, beliefs, emotions……. It’s a common mistake for people to use syllabus and curriculum interchangeably.. or should that be ‘error’? Hey, there’s your next blog post! According to jack C. Richards (2001), syllabus is one of the aspects of the curriculum, a point where the goals of the curriculum are materialized. However, my understanding is that the curriculum can be regarded both as a process and a product. The curriculum as a product takes place before a given course starts whereby the objectives and requirements are determined, the curriculum as a process is what actually happens while it is being implemented, the outcomes of which could be both desirable and undesirable. My name is Erin. I’m finishing my degree in English Language teaching in Israel. Last year I wrote a mini-thesis paper on Language Policy in Bi-Lingual schools in Israel, so I was automatically intrigued by your post on curriculum. I pose a question for you: If the Ministry of Education is responsible for building a curriculum for public school sector, should they also be responsible for the Language Policy? Or should it be left up to the schools themselves? Specifically dealing with multi- lingual schools or even teaching ESL.